So another Walk In Her Shoes week is over; my third time participating in this event for CARE Australia. I love the idea behind the challenge: to walk 100km (or the distance of your choice) to raise funds for CARE’s work in countries where women and girls miss out on opportunities to attend school and work because they have to walk for several hours a day to get basics for their families like water, food and medical supplies. Having to walk six kilometres carrying 20 litres of water on the way back isn’t something that sounds like much fun. I’m often guilty of forgetting that it’s nothing but my good luck that I was born in a country where I have access to plentiful water, food, education and opportunities for work. Walking for pleasure is a luxury that I am grateful for because it symbolises many other things I have. Even so, I found this year’s challenge a struggle. I didn’t build-up to the week through the structured training and gradual increase of my daily goals that I’d done the past two years. And there wasn’t the excitement of being in the local papers like I was last year. (Yeah I did kind of like the attention for a couple of days!) I was distracted by other things going on at the same time, and just as the challenge started I came down with a miserable cold. I think it’s the equivalent of the “difficult second album” syndrome that bands get afflicted with after a successful debut album, only for me, this was the difficult third album. Not such a good analogy then. It sounded better in my head. Anyway, as you know, I struggled through, and I ended up with a total of 150,400 steps for the week. A long way short of the almost 200,000 I did last year, but I’m OK with that. I can have a go at cracking 200,000 next year (maybe!). I’m pleased with what I achieved this year. I’m also thrilled to have raised $610 for CARE Australia – thank you to everyone who donated. I want to keep walking, and so far I’ve continued the routine for almost a week after the challenge finished. I dropped my goal back to 15,000 steps. It’s that high because walking is the only exercise I do, apart from a weekly yoga class, so I wanted to make sure I had to do more than my everyday walking to and from school and work. One week in and it’s going well. Ask me in the middle of winter if I still think this is a good idea . . . So – a successful challenge that has given me a foundation on which I can build a regular exercise routine. Now to keep it going. 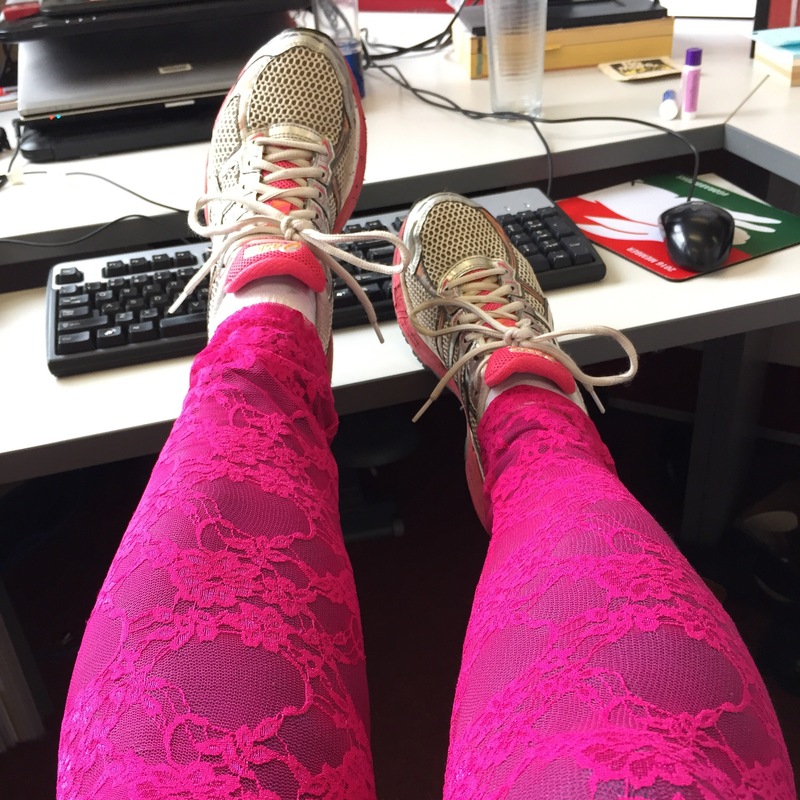 I also intend to wear bright leggings to work more often because I can! 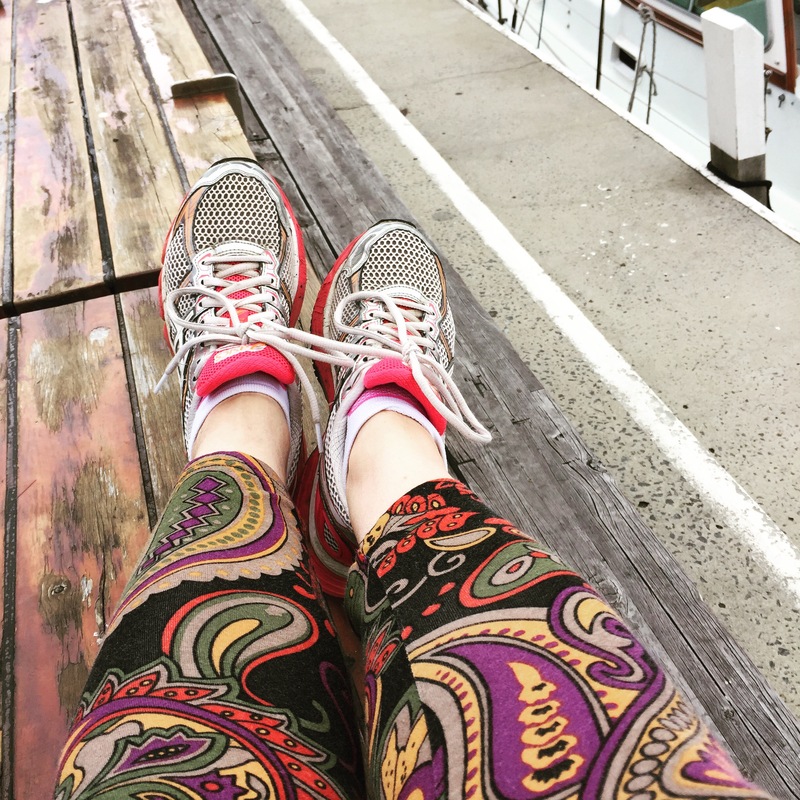 And in case you missed my leggings pictures, here they are for the whole week. Yesterday I thought I was feeling better so, while I had my chance, I went for a long morning walk along the walking track. This time I decided to do the whole track. I knew I wouldn’t have much time to walk later in the day so I had to make the most of the early morning. My cold has moved from head to chest. So less sniffing, more coughing. Super! We had a date in town in the afternoon to see Frank Woodley’s kids show Noodlenut at the Spiegeltent. We were all looking forward to it. Kramstable had loved it when we watched his TV show, and of course Lano and Woodley had been essential viewing for us many years ago. It was a fun show, and we enjoyed it. It was very hot, which made Kramstable a bit irritable, and my learning from the day was to always take a bottle of water everywhere we go. When we got home it was late afternoon, but it was pretty much my last chance to go for a walk yesterday. The late afternoon sun is not my friend, and it was a very uncomfortable walk. I made it in the end. Day 6: 21,312 steps. This morning I got up determined to get through the last day. Only 20,000 more steps and the challenge will be over. If this had been a school day it would have been fairly easy, but it’s not, and I was still feeling rather ordinary when I woke up. However, it is, I reminded myself, a challenge. It’s not meant to be easy. I didn’t feel like doing the walking track this morning, so I headed over the bridge. I think I might have walked too far, and tired myself out. I hoped I’d make it home! Today was one of those mornings where, if I’d had to go to work, I’d have been unable to make up my mind up about whether to go, so I’d have gone, and by 10am would have been wiped out. It wasn’t a work day, so I could go home, have coffee and rest on the couch. I spent the rest of the afternoon watching DVDs and wondering if I should just call it a day. I didn’t want to. It looked like it was about to rain, so I took a deep breath and went out one last time. I was on my way home, with less than 1500 steps to go, when a tweet from CARE Australia reminded me that I’d already completed a week of 20,000 steps a day, because if you remember, I walked 20,000 steps on Monday, the day before the official start of the challenge. AAARGH! This hadn’t occurred to me! I’d finished the challenge already! The only thing that had been missing last Monday was leggings. Well don’t I feel like a goose! Instead of whinging about sick I was, I could have been relaxing and celebrating having finished yesterday. Never mind. What’s done is done, and I’ve finished the challenge for real. I’ll write a reflection post, with my final step count later in the week. Last year’s tshirt gets a workout. Part 1 of this post, in which I try to get into the habit of an earlier bedtime, is here. I decided that, even though I wasn’t feeling so good, I’d get up and go for a walk this morning. Slabs suggested I sleep in and walk later in the day. While the idea sounded good, I didn’t think this was going to work because it’s cooler earlier in the day and walking in the heat* is likely to have tired me out more. And that’s assuming I’d be able to muster up the energy to get out of the house later. I find it much easier to get my walks out of the way first thing, before I get caught up in everything else I’m doing during the day. 2 of 12: I did sleep in. A bit. For me. By the time I got up and out of the house it was light, so I decided to wander along the walking track, which I can’t often do because it’s too dark most days when I get up. 3 of 12: I took it easy. No 16 km walks this morning. 30 minutes was about 3000 steps, and I was grateful for the park benches dotted along the walking track, as I needed a rest by this point. This meant that I’d need to do seven lots of 30 minutes to reach my target. This sounded like a lot at 7am, but I was confident it was doable if I rested up in between. 4 of 12: These signs are quite new. I can’t figure out if the council retro-fitted the dog poo stickers or if someone who was sick of stepping in poo go the shits and stuck the stickers onto the signs themselves. 5 of 12: The river looking very peaceful this morning. I cut my normal route a bit short because I was getting tired and my walk was taking longer than normal. See! I’m not pushing myself. 6 of 12: I used some of my walking time to catch up on my French lessons on Duolingo, which I’d recently started again after a long absence. I followed the principle of making a new habit as easy as possible to do, so I reduced my daily goal to one lesson, which is possible to slot in almost anywhere in my day. I’ve generally tried to do it first thing after dropping Kramstable at school on my way to work. So if you see me walking along hunched over my phone in the morning I’m not on Twitter (probably). I’ll be learning French. After breakfast it was time to take Kramstable to swimming. An ideal opportunity to fit in two of those 30 minute walks I need to do. While it’s not the most pleasant and relaxing walk, as it’s mainly along main roads, it’s a good way to get us both moving. The thing that struck me, as it did last week when we had to walk because Slabs needed the car, was how many cars went past and how few people were walking anywhere – I could count them on one hand each time. Most of the people that were walking were walking dogs rather than looking like they were walking to somewhere for a purpose. As I watched the never-ending stream of cars go past, I wondered how many people were driving because it was quicker and easier than walking. After all, most people are busy, and taking an hour out of your day to walk to somewhere you could drive to and back in ten minutes is a big chunk of your day. Unless I’ve had no car, I’ve always jumped in the car and driven to swimming. It’s so much easier, I can leave a lot later and I have more time at home to do stuff like checking Twitter. I mean vacuuming the floors. 8 of 12: Kramstable had a good swimming lesson. 9 of 12: While we were up the street today we noticed someone had tried to set fire to the community notice board. Nice one. Also up the street, we learned some new roundabout etiquette where you indicate you’re going left before you even get onto the roundabout, and then go straight, confusing the hell out of people who are trying to cross the road. A change from the usual “indicate right when you’re going straight” crowd. 10 of 12: Washing day for the leggings! 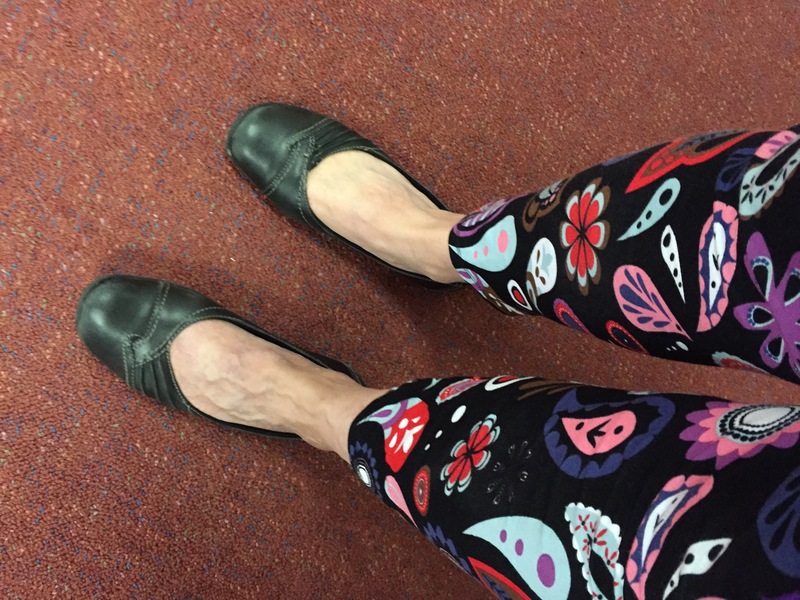 11 of 12: Today’s leggings. Today’s step count: 21,406. Two days to go. I might just make it. 12 of 12: I made lasagna tonight. This is one of my favourite epic dishes that takes all afternoon to prepare. So you know that I’m not overdoing things, I had a rest first. And I went to bed early. * By heat I mean anything above about 18 degrees when the sun is shining. The sun here is burny and melty, and saps my energy every time I go outside, regardless of the actual temperature. 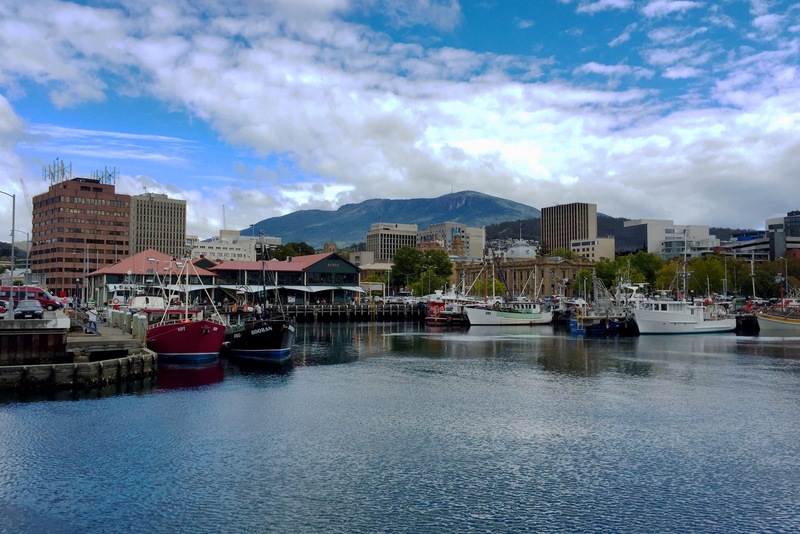 I’m told the sun is more intense in Tasmania than in other places, and I find it to be really uncomfortable to be outside in. I hate walking in the sun. Today is Day 4 of my 20,000 steps challenge for Care Australia’s Walk In Her Shoes. Getting struck down with a cold on Wednesday was unexpected and unwanted. If it’s my body’s way of telling me to get some rest, couldn’t it have waited until next week when I’m actually able to slack off a bit? And if my body needs rest could it, at the absolute least, let me sleep through the night, which, until I got sick, I could normally do very well thank you. Who knows what’s going on?! I can’t stand another night like the last two, so I got some day & night tablets (you know the ones that you have to show ID to get from the chemist) that lady at the chemist said should give me some relief. I hope so. So I’ve been trying to strike a balance between not pushing myself and getting my steps done. I think it’s rather a fine balance. I don’t want to wipe myself out, but I have committed to doing this. It’s more than half way through Day 4, so I’ve passed the half way point. I can’t stop now! On the plus side I’ve been having fun with my leggings. I had someone stop me in the street yesterday, when I was wearing a bright purple outfit to match the leggings, and tell me they thought the colour really suited me and that I looked “absolutely fabulous”. His companion agreed. I’m so unused to anyone saying something like that to me, I wasn’t sure if he was taking the piss or being genuine. I chose to think he was being nice and that he meant it, so that made me feel a bit better for the rest of the afternoon. Even though I’m not listening to competitive me, I was contemplating tackling my longest distance tomorrow morning. But in the spirit of knowing my limits and doing what I can, I’m not going to. I’ll probably space shorter walks over the next three days with some rest, so that I achieve my goal without overdoing it. I woke up at that unspeakable hour this morning to hear an unusual rumbling. At first I thought it was trucks, but didn’t take too long to work out it was thunder, accompanied by a huge lightning show out the kitchen window. Well I wasn’t about to go outside and walk in a thunderstorm. I love the cause but I’m not going to get struck by lightening for it. After tearing myself away from the lighting show, I sat down for my meditation/breathing/distracting thoughts exercise. It started to rain. I had visions of walking round my lounge room for 30 minutes to kick off my step count. Fortunately, the storm was short-lived and I was able to go out. About half way round my circuit I saw more lightning, but it looked like it was further away and there was no thunder, so I imagined I was safe by then. I had to go to work today. I decided to start out with some fairly conservative leggings. The bright ones will come later. Today’s steps included walking to work, a walk around the docks at lunch time, where I almost got knocked over by a driver who thought it wasn’t necessary to put his indicator on until he’d actually started turning the corner (thanks), walking to the boy’s school, doing laps around his school while we waited until it was time to go to his doctor appointment (he’s fine), walking to the doctor’s and walking to and from yoga. A successful Day 2, although I feel the beginnings of a cold coming on, which I really do not need. Day 1 step count: 21,146. Day 1 of Walk In Her Shoes. It’s finally here! I got up at an hour that most people would be fast asleep (this is becoming my new normal anyway so I can get things done in the morning that I’d never do if I slept later, but that’s for another time). I started doing a form of meditation about three months ago, which is where you focus on your breath. I do that first thing after I get up. I’m really good at it. True. I can get to three breaths before I’m distracted with thoughts that I get carried away with for several minutes until I realise I’ve lost focus and go back to the breathing. For three more breaths, until the thoughts creep back in again. I’m so good at sitting still sometimes my Fitbit doesn’t register that I’m awake and records my meditation time as sleep. I digress. I’m talking about walking. I went for a 30 minute walk this morning in the cold and dark. Woohoo. It was really cold this morning. Like thick leggings, two jumpers and woolly socks cold. It had warmed up by lunch time, which was when I decided to go for a walk. I had to change into something more suitable and realised that, as it was my work at home day, I could have reshuffled my hours and walked earlier in the morning. But no, I had to pick the hottest part of the day. I walked to the Esplanade and walked the walking track past Tynwald Park and back to The Avenue, which is the opposite way I usually do that track. I remembered the reason why as I climbed the eleven million steps to the top of the hill. I made a couple of Periscope videos as well. I thought I might do that for a few of my walks this week. Not sure if I can post any of them on here. I will if I can work out how to do it. Otherwise I’ll post them on my very active and well-known Facebook page. I was still about 5,000 steps short when I got home, which I eventually knocked off this evening when, thankfully, it was cooler. So Day 1 is down and I’ve met my step goal on what was always going to be one of the most challenging days, so I’m happy with that. Like I did last year, I’m going to wear different leggings each day for a bit of fun. Here’s what I wore today. I have a couple of new pairs to try out over the week. I’m spoiled for choice. The Walk In Her Shoes challenge starts on Tuesday. I thought that Tuesday was a strange day to start, and it’s taken me several weeks to realise that Tuesday is International Women’s Day. Because the focus of the challenge is on helping to fund projects that “help reduce the distance women and girls have to walk by providing clean water and nutritious food close to home”, starting on International Women’s Day makes perfect sense. Next week will be a big step up. In the past I’ve been pretty much at my target steps before I started, so being a long way behind is a new feeling for me. I know 20,000 steps a day is doable. I’ve done it before. I’ve done more than that. I can do it. And, from look of the forecast, I’m probably going to get soaking wet doing it, so I won’t be able to use my fancy new headphones to listen to music while I’m doing it. Oh well. The key is for me to remember why I’m doing this, and that should be enough to keep me going. Thank you to everyone who has sponsored me and is supporting me. I appreciate it very much. If you’d like to contribute to Care Australia’s work, here’s a link to my sponsorship page.